You can purchase FEP encapsulated O-rings in our web store. Click here to buy online now. Eastern Seals (UK) Ltd can provide practically any size of encapsulated rings. We hold many sizes in stock. 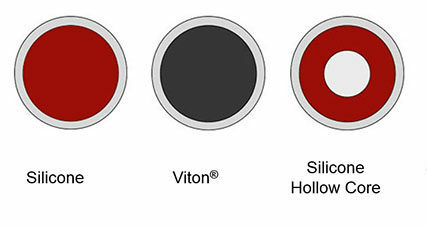 We offer solid and hollow core styles as well as cam and groove gaskets. Hollow core silicone Encapsulated O-Rings have greater compressibility compared to solid core O-Rings. The hollow core flexibility means less clamping force is required to enable its sealing abilities. These O-rings are ideal for fragile applications using sensitive materials, such as glass or light plastics, They are particularly useful for where the sealing area may require room for movement during operation.